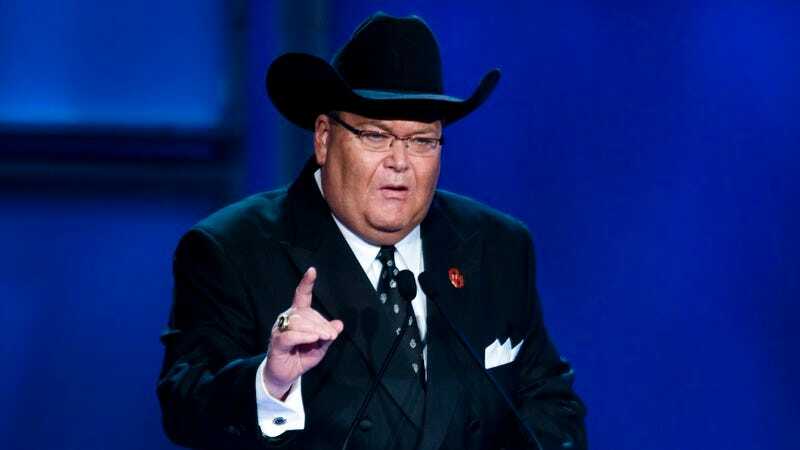 Jim Ross is the greatest announcer in the history of professional wrestling, full stop. This is not in dispute. And when he was relieved from his position from the WWE in 2013, no one would have faulted him for riding into the sunset. But Ross has not only kept busy, he’s experienced a career renaissance—becoming the lead English announcer for upstarts New Japan Pro-Wrestling, host a popular podcast, and a one-man live show where he regales in wrestling stories, as well as dabble in boxing announcing. That circle was complete when, just last Friday, Ross re-signed a two-year contract with the WWE. It’s also been a time of tremendous sadness for the 65-year-old Ross, whose wife Jan unexpectedly passed away in March. Nevertheless, he fulfilled all his appearances this past weekend in Orlando, home of WrestleMania 33, including a surprise return to announce The Undertaker’s retirement match. It was therapeutic, he said, to be among friends during his grieving process. Ahead of his “Ringside” Chicago show at Zanies Rosemont May 21 (tickets go on sale Saturday morning), we spoke with Ross about his whirl-windiest of whirlwind weeks. The A.V. Club: So you’re doing your one-man show in Chicago, and the venue is just three miles from the Rosemont Horizon, now called the Allstate Arena. A lot of wrestlers have said their favorite arena to work is the Rosemont Horizon. What is it about that venue that wrestlers enjoy? Jim Ross: It’s got an indescribable feel, quite frankly. The building’s got a personality, and it reflects the personalities of those sitting in the seats. For me, I’ve never performed or worked in a more memorable arena. And selfishly for me, I was sitting in that arena when I found out I was going into the WWE Hall Of Fame in 2007. The building’s got a personality that’s living and breathing, and the atmosphere is really amazing. It makes you glad to come to work that day. AVC: Any favorite matches from the Rosemont Horizon? JR: The WrestleMania 13 card with “Stone Cold” Steve Austin vs. Bret “The Hitman” Hart, with Ken Shamrock as the referee, which often times gets overlooked. It was one of the best WrestleMania matches in my view. And I would have to say, with my tongue firmly planted in my cheek, that my resounding victory over ESPN SportsCenter star Jonathan Coachman in a Country Whipping match would also rank high on my list of distinguished athletic accomplishments. AVC: What other fond wrestling memories do you have about Chicago? JR: In ’89, Magnum T.A. and I called the Ricky Steamboat-Ric Flair match at the UIC Pavilion. As a rule, I never needed to know the finishes—it wasn’t something I needed to precondition myself with. So I remember walking to the announcing position before the show, and George Scott was the booker. He pulled me off aside and said, “You know what we’re doing tonight?” And before I said, “No, I don’t want to know,” he said, “We’re going to change the belt.” It didn’t kill it for me, but I didn’t need to know that. But they went out there—the two Ricks—and had a masterpiece. It was a pay per view event, and that match really will always resonate. That year in 1989, I called three Flair-Steamboat matches with three different partners, and I loved them all. I had the opportunity to see these guys write this amazing classical music, and they’re depending on me and Magnum to give them the lyric to fit that music. It was a memorable night in Chicago, and there were a lot of them, honestly. AVC: How did your deal come together with WWE? What will your role be? JR: Talks with WWE began around six months ago. I never had any reservations about going back to WWE, it just wasn’t the right time based on other things I had committed to do in my career at that time. Talks escalated a couple months ago, and my wife was very excited about the opportunity for us to go home, as she termed it. She was excited about going to WrestleMania and seeing all her old friends, and I shared her optimism. I didn’t get a chance to get her to the red carpet, but I do believe she was present when I called the Undertaker match. Anyhow, my contract was signed Friday night of WrestleMania weekend. I did most of my negotiations with [executive vice president] Kevin Dunn. But [chairman and CEO] Vince McMahon was also very involved, and I did speak with him. I spoke to [executive vice president] Paul Levesque. It was a team effort. I think I’m going to do 30-40 dates in my first 12 months of my deal. Those dates are to be determined. There’s nothing they can assign me that I haven’t done before. How many wrestling matches you think I’ve called in my lifetime—100,000? If they want me to do U.K. or NXT or Main Event, I don’t care. It’s all good to me. My days of being the lead guy, the No. 1 voice—all that is way yesterday. Guys who’ve had those issues like I have had in my career, they have self-esteem and confidence issues. I have both those. Totally happy to admit it, but I ain’t got them no more. I’m 65 years old. I feel great, I just lost my wife, I’m trying to get back on my feet here, and I’ve said this and I truly mean it: I’m happy to get my jersey back. I’m happy to re-sign with my old team. Whatever role I need to play, I’m fine with. AVC: Will you still be involved with the ITV show? And how about your New Japan announcing with AXS TV? JR: No, I’m not gonna be involved with ITV. Yes I’m going to be involved with AXS TV and New Japan. I’ll continue to work with them and fulfill my contractual obligations with AXS. But I’m not going to be part of the World of Sport relaunch for ITV. I would have been, but I’m not able to do that now. I’ve got plenty on my plate as it is. AVC: How about the G1 Long Beach shows with New Japan? JR: If they do a special, I’m under contract. I’ll go to work. AVC: You’ve had an awful few weeks, with the unexpected passing of your wife, Jan. No one would have faulted you if you missed WrestleMania weekend—and yet, you showed up for all your bookings. What was it like to be amongst fans and colleagues and friends who obviously loved and care for you so much? JR: It was the perfect medicine. It’s what the doctor ordered. Some people, I understand, had a problem of my grieving technique. Apparently my grieving was not approved by everybody. I don’t know the formula or have the manual on grieving. All I know is that I was shaken to my core, my life changed forever, in a way that did not have to happen to a beautiful, healthy woman who was the love of my life. I only had the option of moving forward, and trying to fulfill her wishes as best I could. It was timely and heartwarming. The love that I received in Orlando was overwhelming, and sometimes I got to my room and I was spent. There’s only so much emotion you can dip into. I did my show on Sunday, kept it to myself without confirming where I was going to go after the show was over. I went back to my hotel, took a shower, ironed my shirt, pressed my suit, got another car from the WWE and they took me to the Citrus Bowl. It was a whirlwind of a day. Monday I did my podcast production. I was really busy, really tired, had three hours of sleep. Then Tuesday was when it hit me. There’s no more noise, no more neon, no more adulation, no more hugs. It was just me and an empty house. That was a challenging day. That’s the first time I come from a booking in WCW or WWE that my wife wasn’t there. AVC: I can’t help but go back to that moment at the Citrus Bowl, when Boomer Sooner played, and the crowd erupted as you walked down that ramp. Take me back to that moment. JR: I was completely impervious. I was so focused on taking a step at a time, not wanting to trip and fall like an old fool and break my hip. It was a surreal, slow motion, distorted audio thing. I haven’t watched it back yet, but I will. I’m just preparing myself for that. But I was told it got a real good reaction, but I need to hear it back on TV to hear how it sound. A lot of my friends were in the arena, so it was really neat. I was thinking about my wife, but I didn’t want to fixate on that. Because I didn’t want to start crying about it, to be frank. Those that say, “Oh, he’s just a wrestling guy.” They have, unfortunately, never experienced the love of their fan base like I’ve experienced from mine. And I feel for them, because there’s nothing really like it in the world. People I’ve never even met believe they know me because they grew up with me. I feel a certain obligation to not let them down, which was why I kept my bookings in Orlando. I met all my obligations. My wife would have wanted that, and it was a great moment in her memory. AVC: You called what appeared to be The Undertaker’s retirement match. Did you have any interactions with him after the show backstage? JR: Yes, I did. And I had interactions with him before. He used an RV as his dressing area. I went in his RV when I arrived hours before we were going on. So we had a very good personal conversation. We’ve been joined at the hip for a long, long time, even back to the WCW days. I helped get him into WCW from World Class Championship Wrestling. I thought at the time, you don’t see too many 6-foot-9, 300-pound guys who were athletic. Young Mark Calaway was an athletic beast. So we had a nice conversation. [And after the match], a big hug afterward. I cried, he didn’t want to cry, though he might have had a tear. It was very emotional for him afterward, and I didn’t want to monopolize his time. It sure as hell wasn’t about me, it was about him. What he helped facilitate for me was the greatest honor I have received in wrestling. I’ve been in three Halls Of Fame, and they pale in comparison to having a legendary guy wanting to bring me back—whether I was under contract or not—to be part of the broadcast team, so I can add to his soundtrack of that match. It was a really emotional day. AVC: The Undertaker specifically asked for you? JR: I was told by others that Mark and Vince collaborated, and they talked about it. Mark had a suggestion, VInce thought it was a great idea. Look, there’s one captain of the ship, and I give Vince a hell of a lot of credit, because if it wasn’t for him facilitating it, it wouldn’t have happened. I’m very grateful for both guys. It was quite the honor. AVC: Any talents on the WWE roster you’re most intrigued by coming out of WrestleMania? JR: I like the guys who were in the main event tag team match on Raw: Kevin Owens, Finn Bálor, Seth Rollins, and Samoa Joe. You can’t go wrong by giving those guys increased playing team and more valuable minutes in the hopes that as their evolution continues, that the fans will accept them on the level that they would have accepted Triple H, Shawn Michaels, Steve Austin, or The Rock. Big stars. Somebody on the roster—hoping more than one—have got to have a breakthrough and become the next big thing. It might be Roman Reigns, it might be A.J. Styles, I don’t know. The fans have got to connect with the talent. The good news is, the WWE has several talents that are on the cusp, that their work will certainly support the increased role, but they still have to make that all important emotional connection to the audience. And there’s just no formula for that, it either happens or it doesn’t. But it’s largely up to the talents to make the connection to that audience. AVC: If you watched Smackdown on Tuesday, it certainly looked like Shinsuke Nakamura could be the guy. He felt like the most over guy on the roster on his first night there. JR: He’s a phenomenal talent. I saw him at Wrestle Kingdom 9 at the Tokyo Dome. I told everybody when I got back that he’s a fascinating talent. He has the most amazing charisma, he’s an MMA guy, a tough guy, spoke some English. He told me he was influenced by Freddie Mercury and Michael Jackson, and I loved that. But here’s the deal: He’s got to work on his English. He has to communicate with the biggest part of his audience. He doesn’t need to be a skilled orator, he doesn’t need to be Paul Heyman, he’s got to convey his message and feelings verbally to his audience. That’s the only missing piece he’s got. And the good news there is that can easily be addressed and solved. AVC: The last two years you’ve had a crash course in Japanese pro wrestling. What do you know now about the Japanese style of wrestling that you didn’t know two years ago? JR: My experience with Japanese pro wrestling has been on a need-to-know basis. I didn’t chase down the videotapes back in the day. Since they’ve become more accessible digitally, I’ve become a big fan of it. When Mauro Ranallo came to the WWE and AXS brought me in, I was solidly versed, but not expertly versed. The difference is, by and large, they’re still very much invested in the concept of telling an understandable, transferrable, meaningful, bell-to-bell story. They still have the entrances and all the sizzle, but some promotions, and some talents, rely more on the sizzle than the steak. I love the fundamental soundness of New Japan. I think every promotion can learn from one another, and people can learn from New Japan how they’re trained, how they approach the game, the realness of it. And I like the booking that on a given night, no one is untouchable. On a given night, a wrestler who executes his finisher could beat anyone else with that finish. It’s fundamental, old-school soundness, and I enjoy it. AVC: Which New Japan wrestler do you think could transfer his talent to the WWE? JR: Well, obviously. Kenny’s a big timer, there’s no doubt. He’ll be able to pick his poison when he’s ready to make that decision. AVC: Have you spoken to Mauro Ranallo since he took his leave of absence? JR: No, I did not. I’m respecting his privacy. But I did send him a text message. I saw how he tweeted out me being at WrestleMania, which was thoughtful and very kind. But I haven’t picked up the phone and called him, simply out of respect for him. He knows I care about him, he knows I’m there for him. And if he ever wants to talk, I’m always available to him, night or day. Mauro fights a tough battle every day with his mental illness. The bipolar disorder he’s talked about publicly a great deal, it’s no day at the beach, especially when you’re in a profession that’s packed with pressure and anxiety. No matter how good people think a guy like Mauro is, and Mauro is very, very good, or they say “J.R. does this all the time, he can’t be nervous”—well none can be farther from the truth. We all have to hold up to our highest standard, which is ourselves. I’ve always believed you’re only as good as your last show. Every time I go out there, I haven’t earned the right to coast. Ringside with Jim Ross will take place at Zanies Rosemont on May 21. Tickets go on sale at 10 a.m. Saturday.